Yesterday, we talked a little bit about designing a new vegetable garden and using succession planting principles to maximize your results. The garden image I shared in that article was from this past weekend (April 2014). To better illustrate the progress being made, the picture below is how it looked last summer. (The growing season was already well underway when we moved in, so we had to put something together on the fly). 6 raised cedar beds (8′ x 4′) and a couple pots of herbs were the extent of it. It’s not much to look at, but it got the job done. 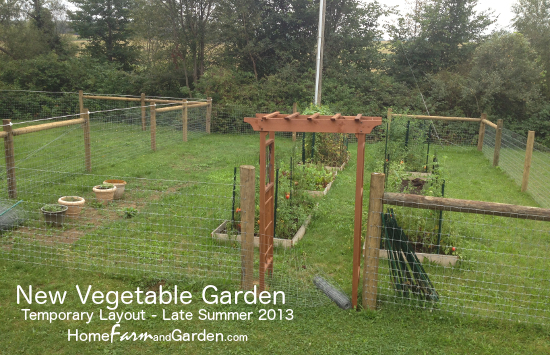 🙂 (If you’re interested, I just added a vegetable garden design photo gallery to keep track of future progress). Yesterday, we also talked a little bit about succession planting, which is a growing method used to maximize the yield of a particular area in a single season. Succession planting is all about the efficient use of time and space to produce high-level results. There are a couple of ways you can approach succession planting. One option is to focus on growing a single crop in a defined area. The other option is to inter-plant several complementary plant species within the same area. Regardless of which option you choose, it’s a good idea to start small with one or two beds until you get the hang of creating a planting schedule that works for you. In general, experimenting with a single type of plant or several that are closely related, such as different types of salad greens, is also recommended. Depending on what plants you plan to grow, you can either employ successive planting, simultaneous planting, or a combination of the two. Successive planting refers to planting small amounts of the seeds over and over again throughout the season. The seeds planted can be either from the same plant or from two or more complementary varieties or species. On the other hand, simultaneous planting involves planting several varieties of either the same or different types of plants with varying maturity dates at once. Diverse plants with early, mid and late maturity varieties are ideal for simultaneous planting. Tomatoes are good examples. Lettuce and other salad greens are perfect choices for successive planting thanks to their fast growth cycle. The same can also be said for many herbs, such as basil and cilantro. Of course, the primary benefit to planting new seeds or seedlings every few weeks is that it ensures a continuous supply of fresh produce all season long. Temperature preference is another factor to consider when choosing two or more plants for successive planting. Some plants thrive during cooler seasons, while others are more tolerant of hot summer weather. By understanding what conditions your plants prefer, you can make the best use of your available growing space. For example, you can plant cool weather crops like radishes and carrots early in the year and then again in late summer or early fall. In between, you can fill those beds with more heat-tolerant transplants such as eggplant or hot peppers. The key to a successful simultaneous planting is to choose non-competing plants with different maturity dates. You’ll also want to note what type of root structure they have (shallow versus a single, deep tap root), how much water and sunlight they need, and which nutrients they require. If you get stuck, pick up a reputable companion planting resource to answer any specific questions you may have. 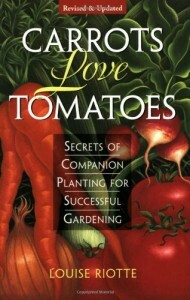 I highly recommend Carrots Love Tomatoes: Secrets of Companion Planting for Successful Gardening. (affiliate link) I personally prefer hard copy resources that I can flip through and mark up, but it is also available in Kindle format, as well. Although the principles behind succession planting may seem overly complicated, don’t get discouraged and feel like you need to know everything at once. Start small with only a few plants and a single bed and work your way up as your knowledge and skill increases. Let’s keep in touch – use the form below to request periodic updates on topics like this!